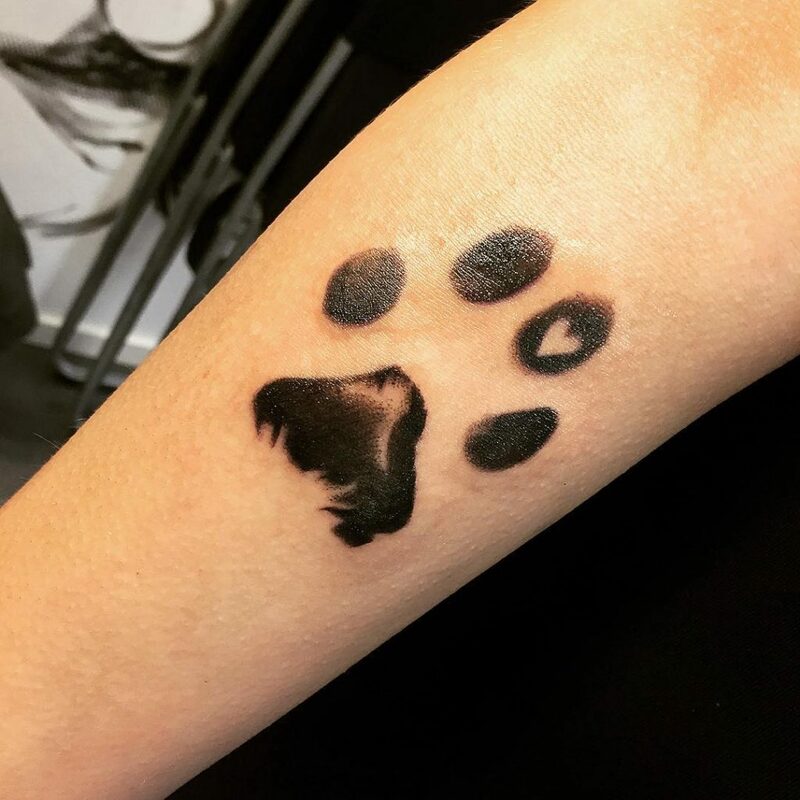 These dog paw print tattoos will have you heading over to your tattoo artist, with your favorite design in hand. Check out the cutest and most creative designs here. 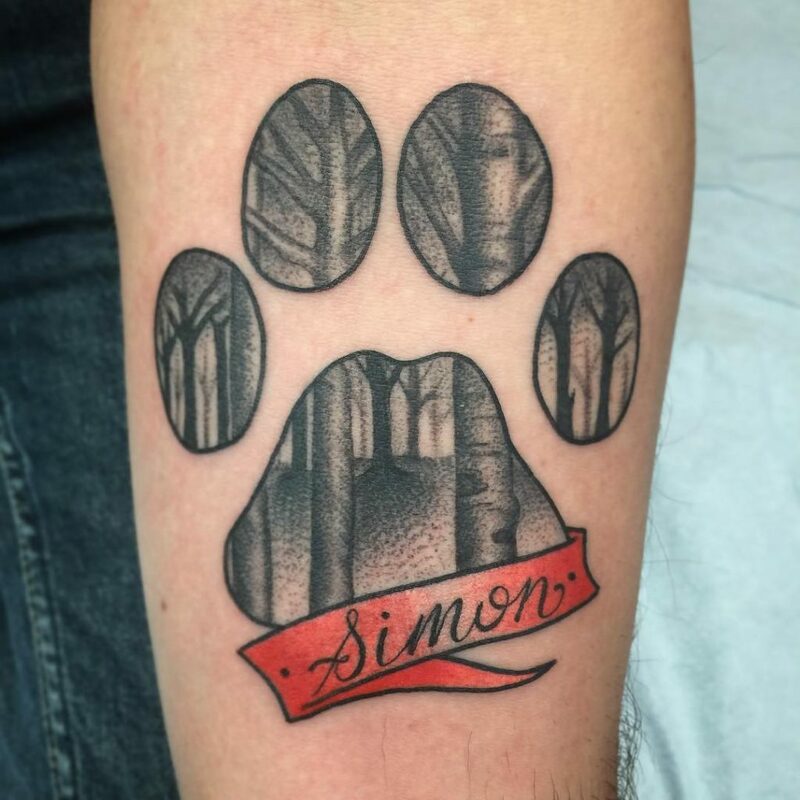 There is no better way to celebrate your furry friend than with a tattoo of their adorable paw prints! 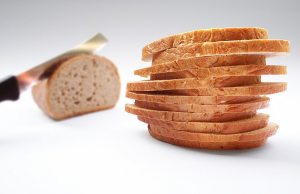 If you are looking for an artistic way to do this, you have come to the right place. 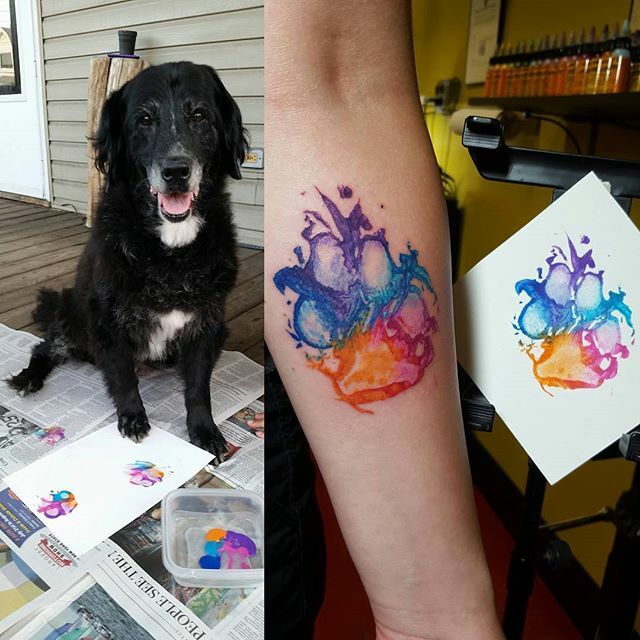 If you want to get a perfect recreation of your pup’s paw print, why not let them be the artist? 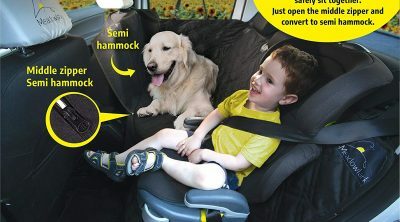 Here, you can place your dog’s paw in non-toxic paint or ink and get a mirror image of their pad. If you are considering getting a full-sized portrait of your pup, you can always personalize it with your dog’s paw print. 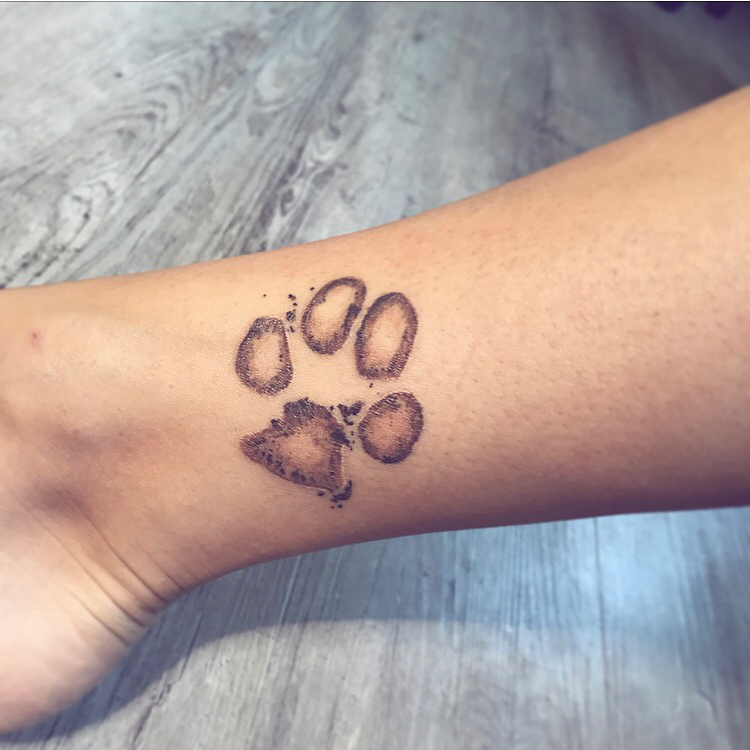 Get an imprint of their paw and use it as a stamp of approval for the portrait. 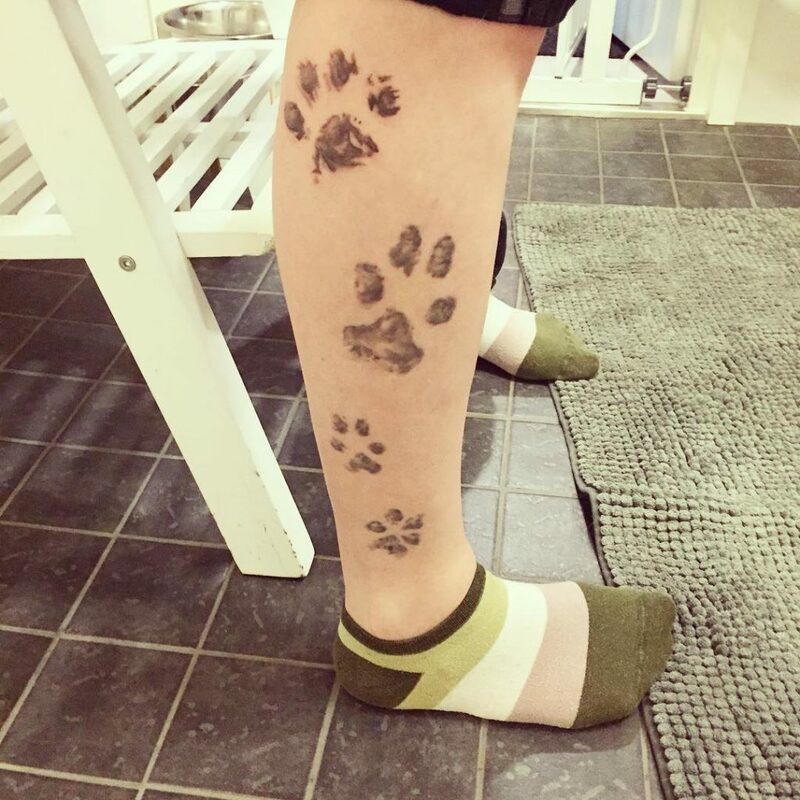 Does Fido have a paw print like no other? If so, make it a point to include these details in your tattoo. It will definitely make it more meaningful. 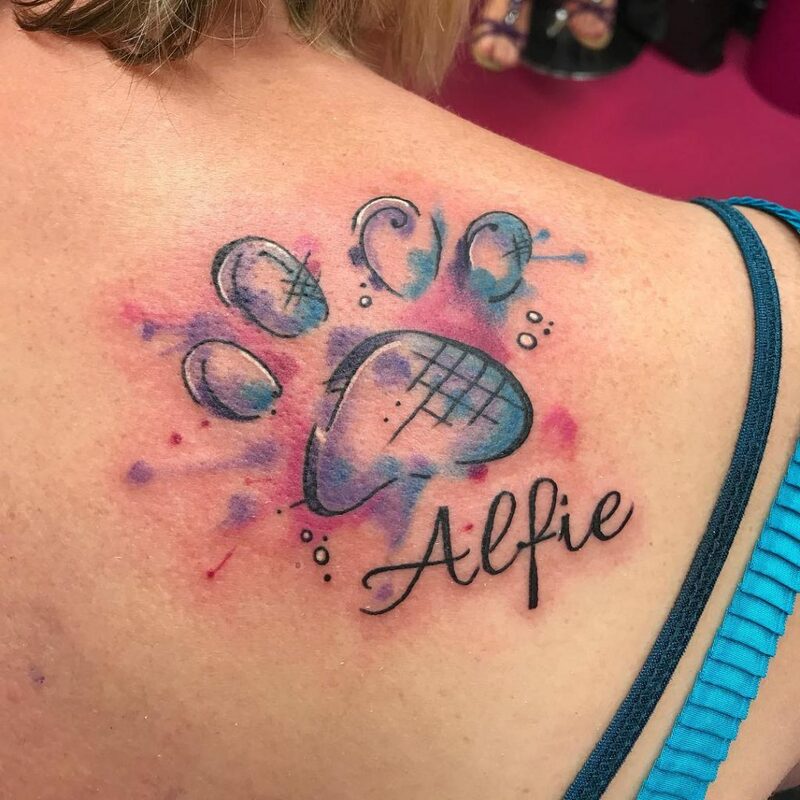 If your paw print tattoo is looking a little lonely, consider adding your pup’s name underneath. This way, the whole world will know exactly who it is you are celebrating. 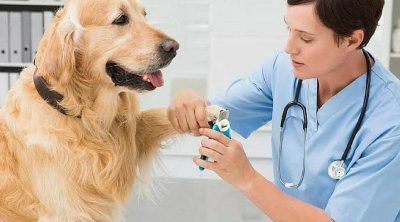 Only you know the impact that your furry friend has on your life. 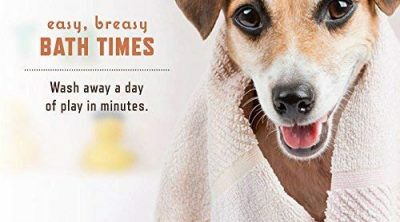 So, why not spread the good word about just how much your pup means to you! There are a few things more difficult than saying goodbye to your dear friend. 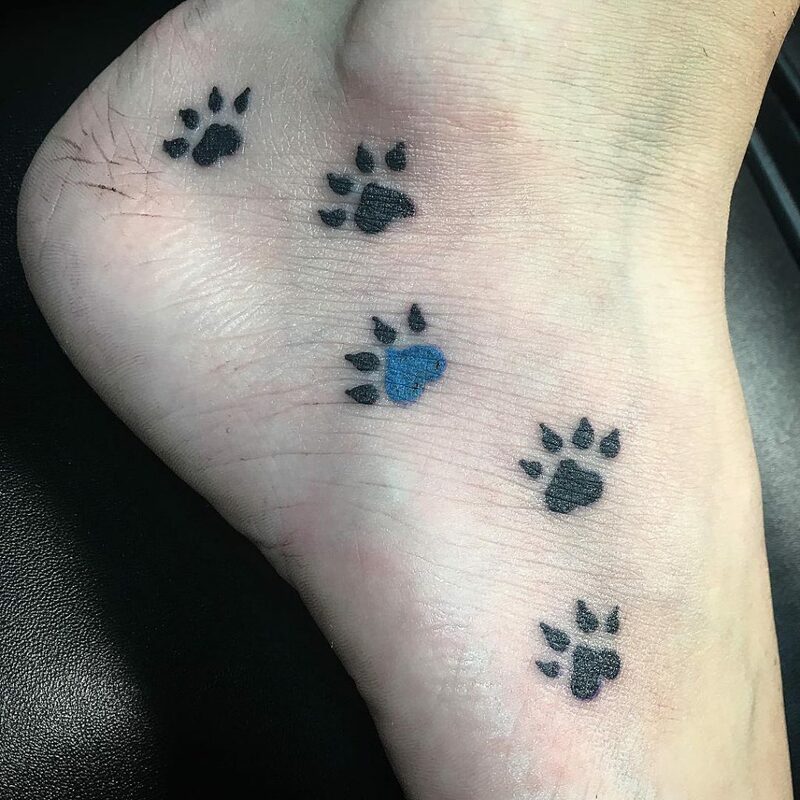 However, a paw print tattoo will make certain that they will always be with you. The watercolor trend has been around for a while and looks like it is here to stay. 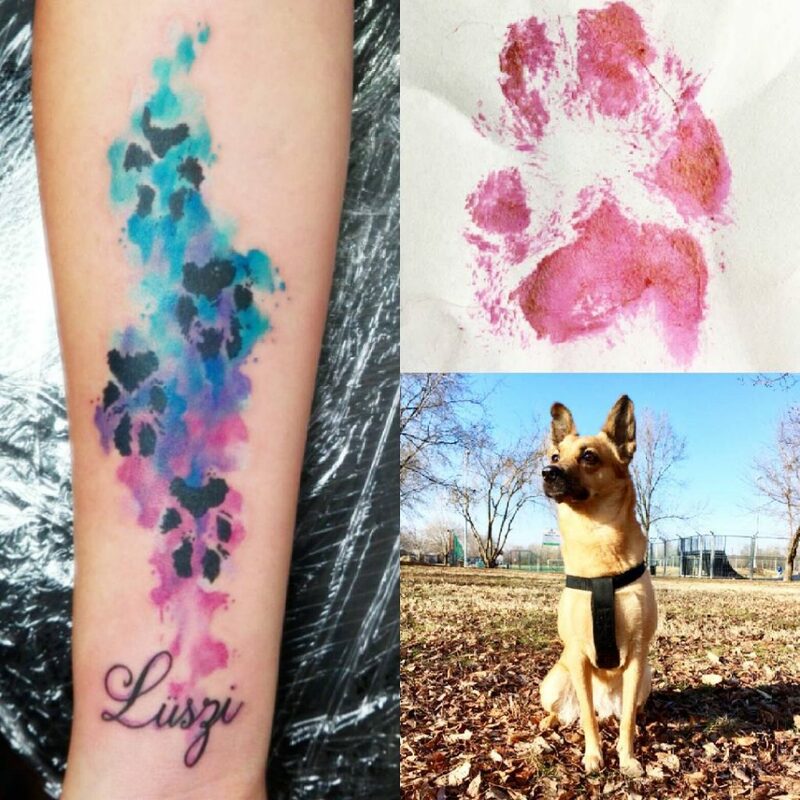 By incorporating this concept with paw prints, you will get a burst of color that is truly stunning. When it comes to pups, the more, the merrier! Of course, this means that you have to find a way to incorporate all of them in your ink. One way to do this is to have them in order of their paw size – how cute is that? While paw prints and flowers don’t actually have anything common, these elements do work beautifully together. 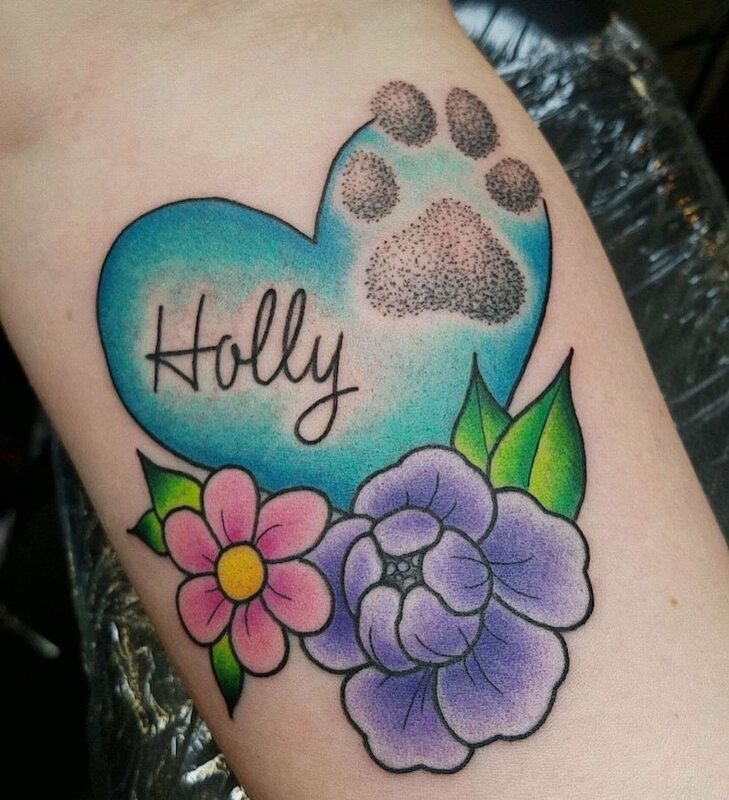 A bouquet of flowers surrounding a paw print is definitely a great tat to add to your skin. Let’s face it, the only time you really notice your pup’s paw prints is when its muddy imprints are smeared all over your floor. Recreating this effect isn’t just creative, it is also super cute, as you can see here. It has been established that your furry friend isn’t exactly the neatest member of your household. This is why there is no need for your tattoo to be neat either. So, don’t be afraid to get a little messy with the colors. 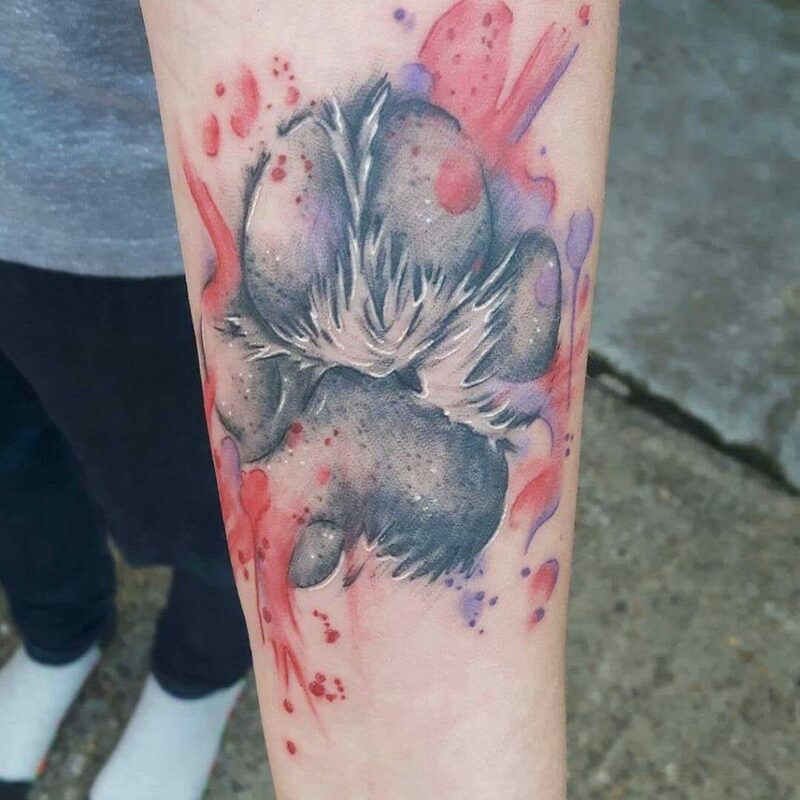 You don’t always need to add a lot of detail to get a beautiful dog paw print tattoo. Sometimes, even just an outline can be enough. Of course, you can feel free to add little elements here and there to really bring the ink to life. If you really want to go understated, you may want to opt for a white ink tattoo. If you have relatively pale skin, this tattoo should blend right in. Only people looking closely will be able to spot it. 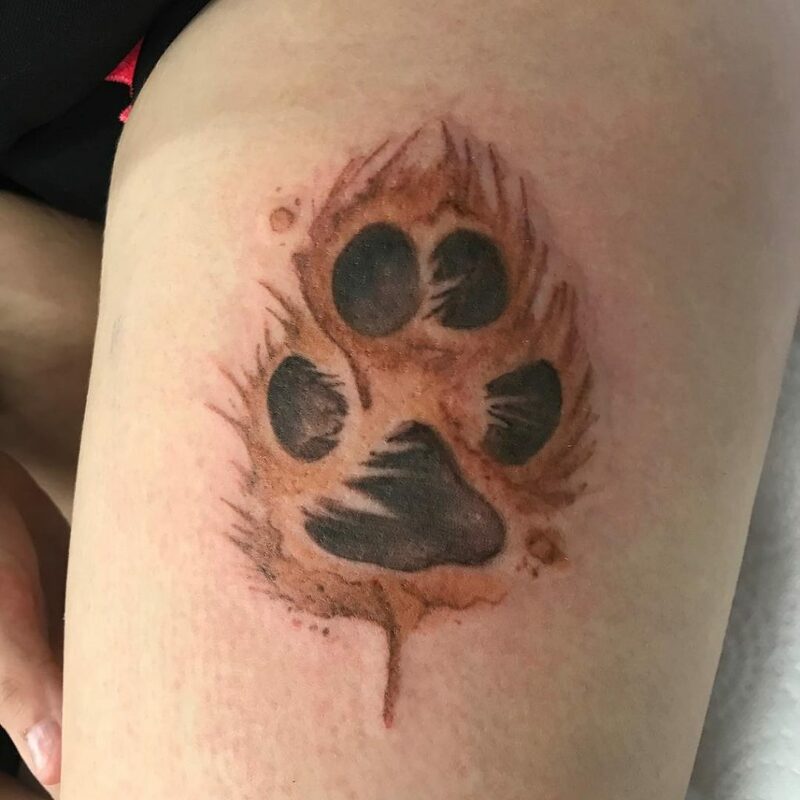 In the end, a tattoo of your favorite pooch’s paw print is meant just for you. So, if you want to keep it hidden or just a little closer to your heart, that’s fine too. 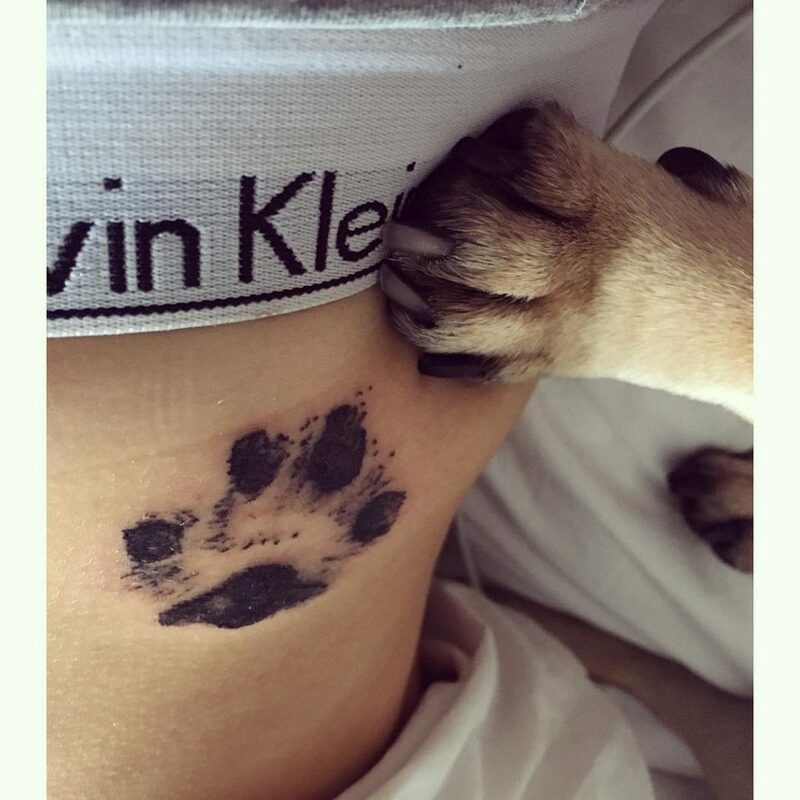 Here, you can just ink the paw print across your ribs. 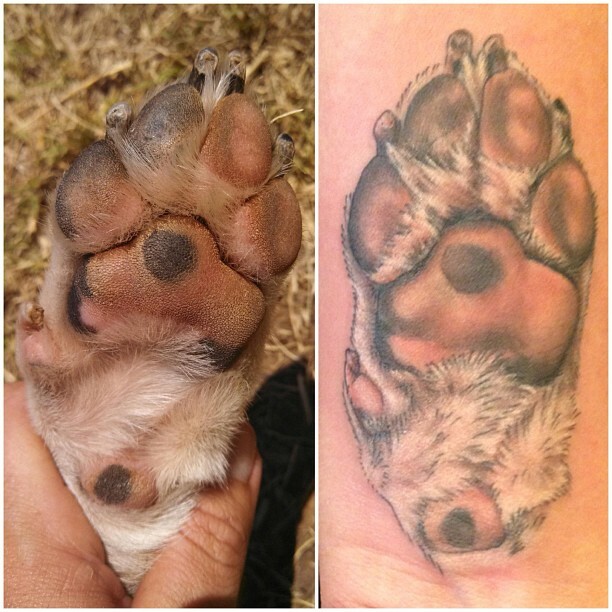 As you can see, you can copy your dog’s paw print without having to go overboard with details. 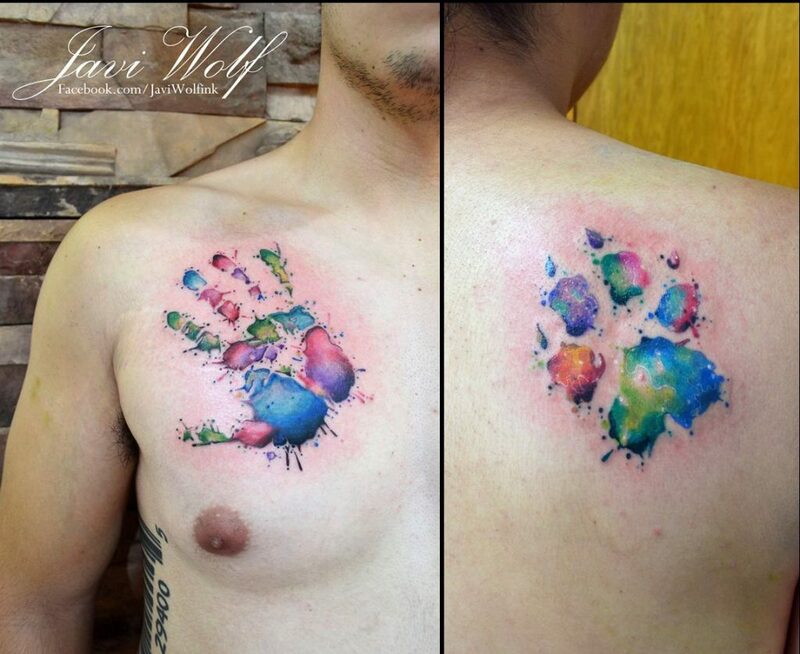 In this instance, the tattoo is personalized with color rather than details. Does your heart beat for your doggo? 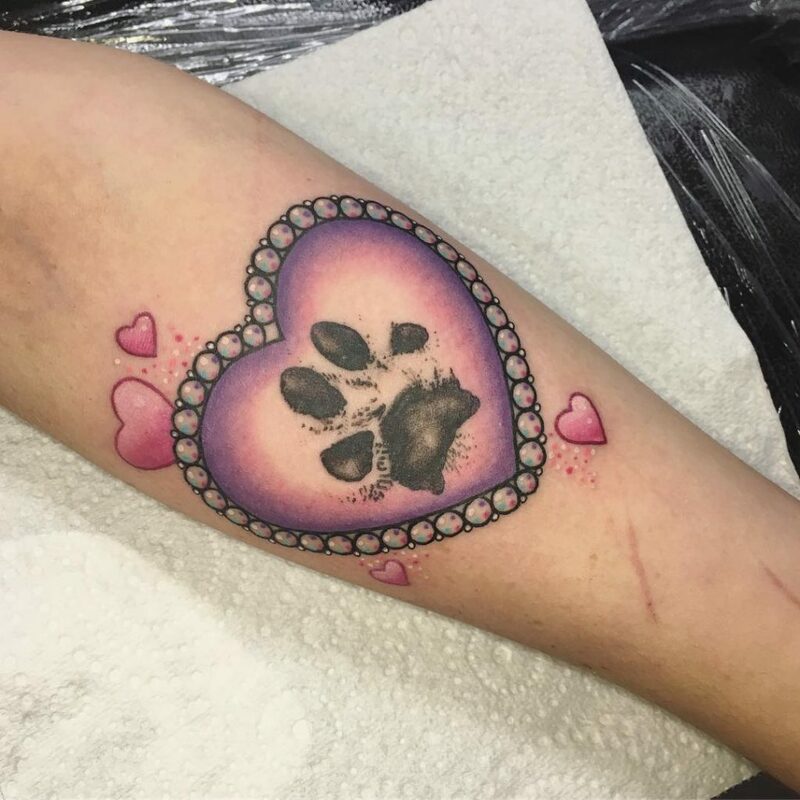 Well then, you can incorporate a tiny heart in your paw print tattoo as a symbol of your never-ending love for your pup. 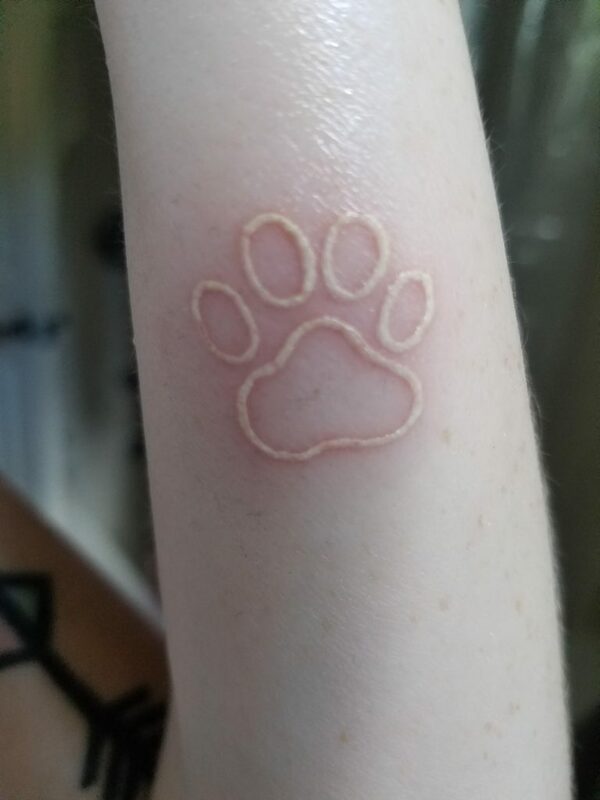 Sometimes, it is the smallest tattoos that have the greatest impact. 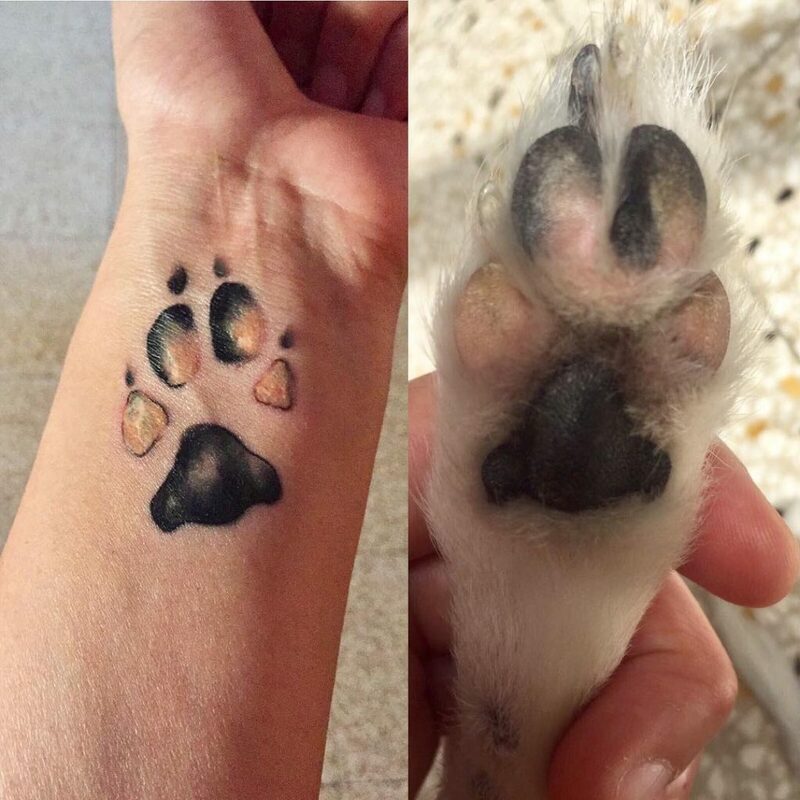 These tiny tattoos are incredibly cute – just like your dog and their paws! 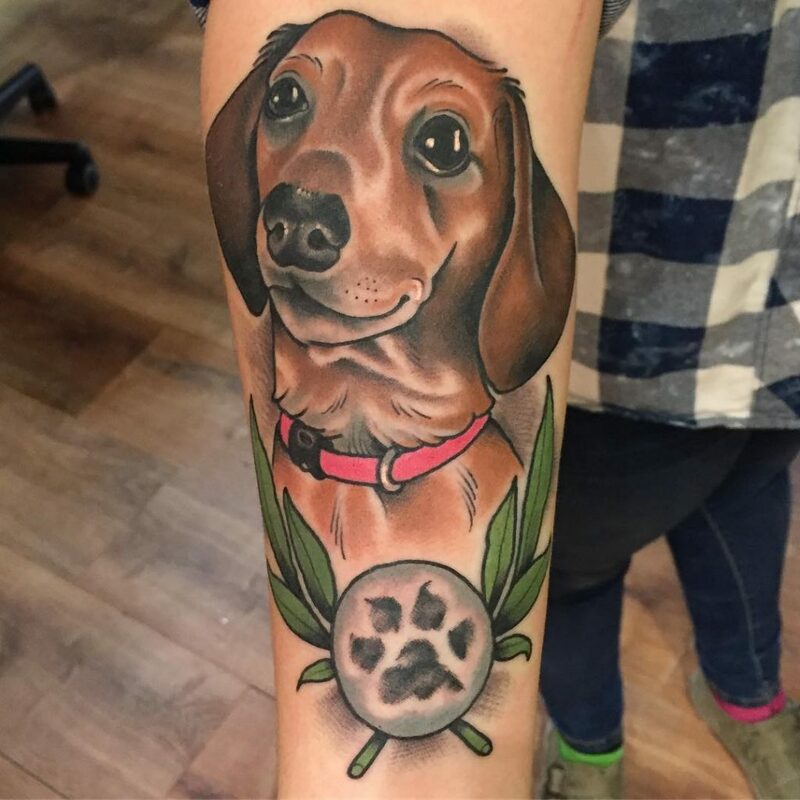 Why not integrate your pup’s portrait into their paw? Here you get a gorgeous peek-a-boo aesthetic that adds power and beauty to the tattoo. 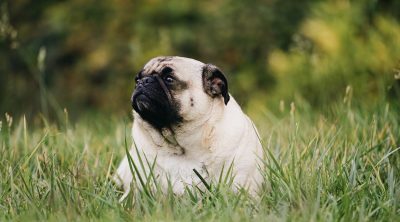 You probably have a ton of pictures of your pooch around the house. 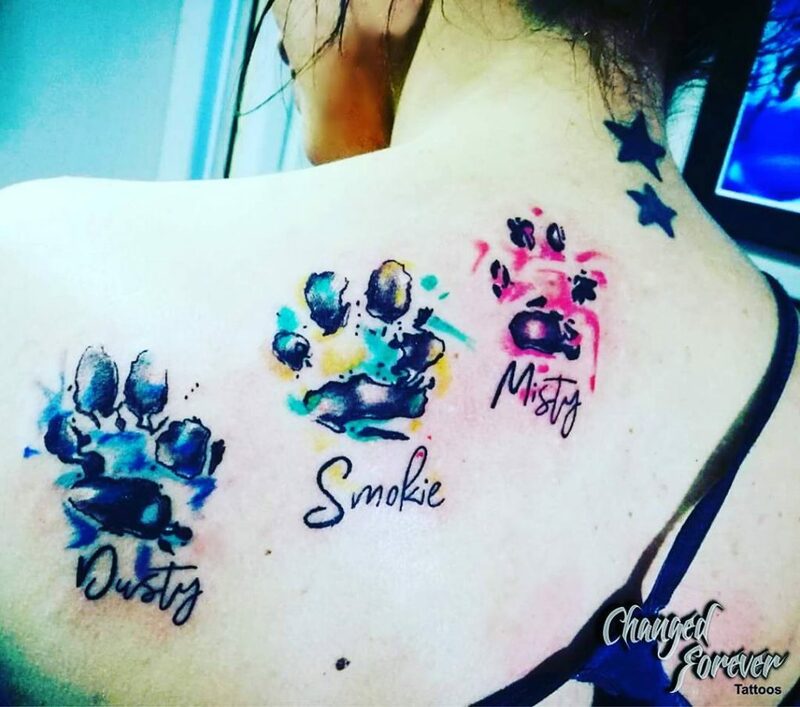 Well, don’t you think their paw prints should be framed as well? Once you see this tattoo you will certainly agree. A bond between a dog and a human is unbreakable. 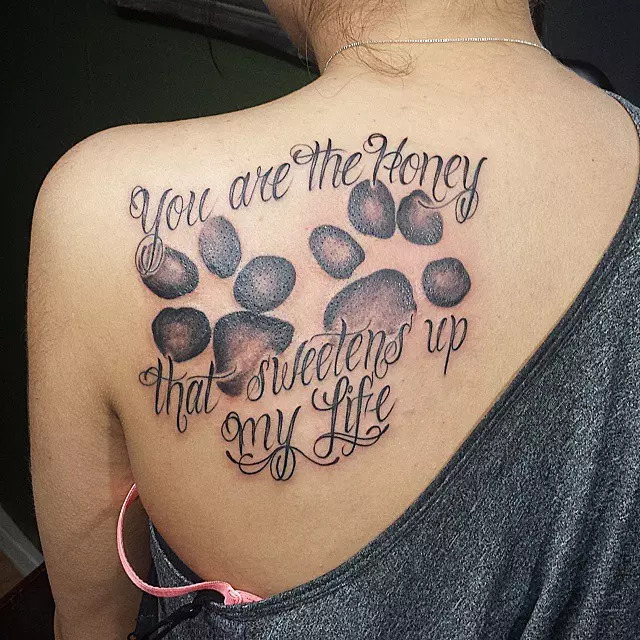 As you can see here, this tattoo embodies the sentiment by connecting both palm print and paw print in a stunning and meaningful way. 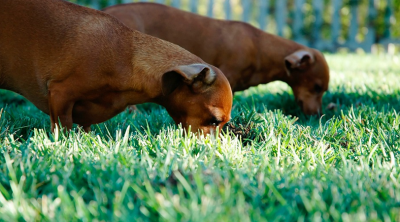 Did you know that some people use paw prints to symbolize moving forward in their lives? 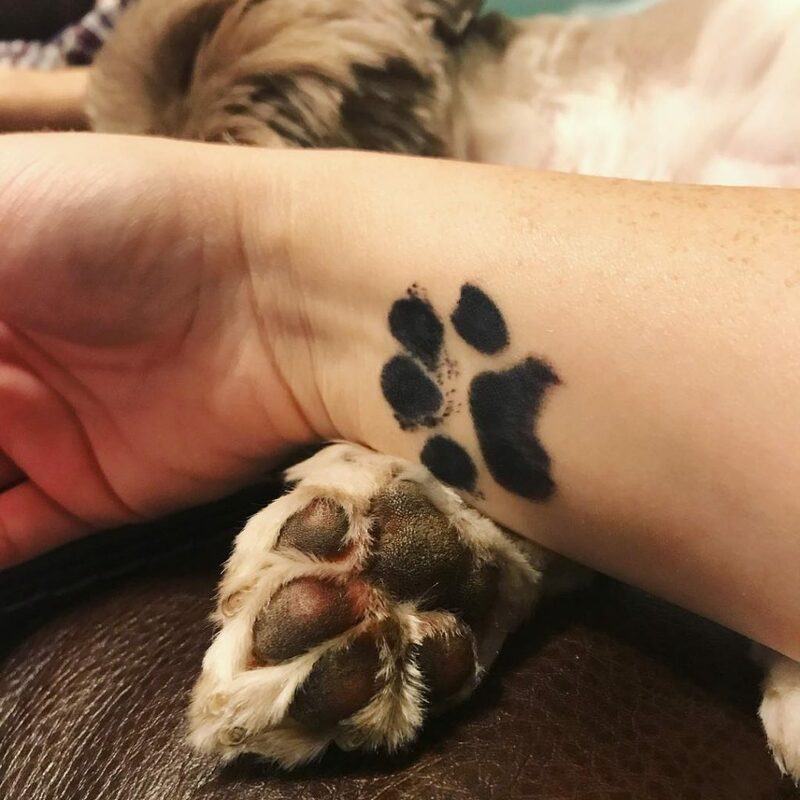 If you are hoping to make a big change, get your paw print ink on your wrist to always remind of the direction that you should be moving in. C’mon, you know that your pup is out of this world. 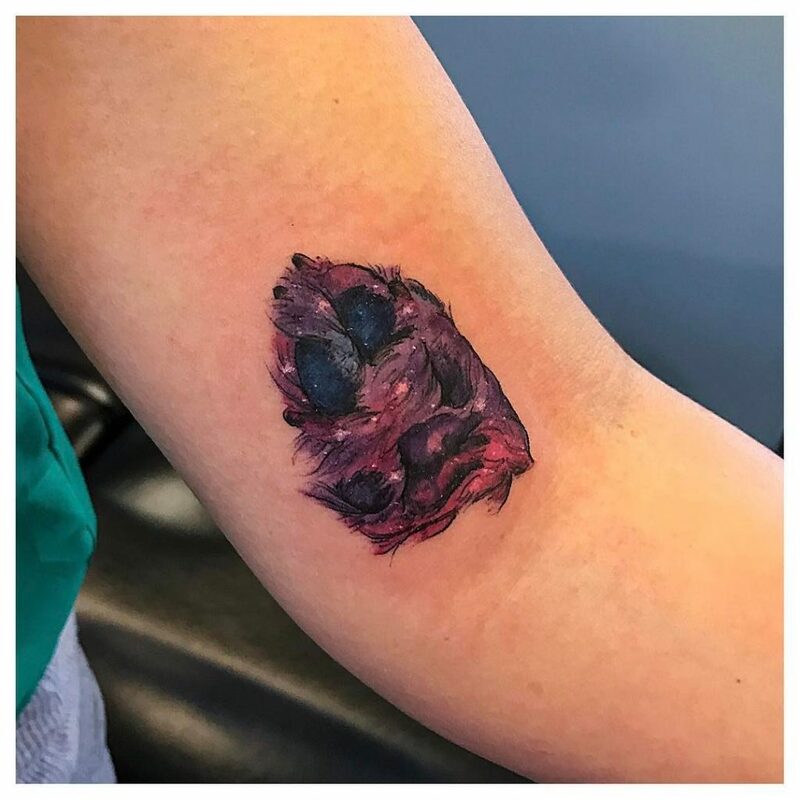 This galaxy-inspired tattoo is a great way to spice up a paw print tattoo while remaining whimsical. 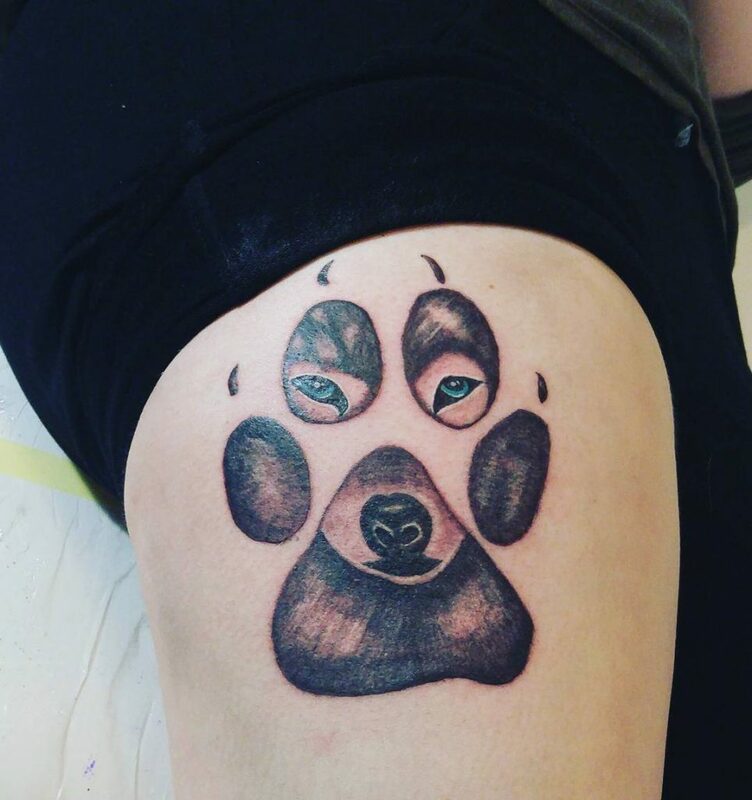 Since your pooch acts like a cartoon character most of the time, it would make sense for you to get this tattoo. While it is still incredibly realistic, the animation-like coloring is a nice and unusual touch. Are you itching to go out and get some of these looks inked on your skin or do you already have something similar in mind? Let us know in the comments below. 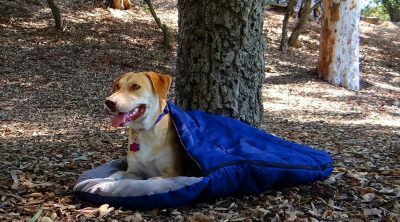 And, before you go, make sure to pass this information on to another pooch crazy friend!